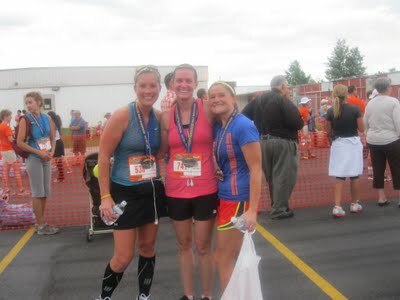 I ran the Timpanogos Half Marathon on Saturday. I was a little unsure of what to expect of myself in the days leading up to the race. After being sick for over a week and two short runs on Wednesday and Thursday that were more difficult than normal because I still had a cough and congestion, I was afraid to even set any goals. Of course I wanted to PR, and a sub-1:55 would have been even more awesome, but I didn't set out with either of those goals solidified in my mind because I still wasn't feeling 100% when I went to bed Friday night. I did, however, get to bed at 8 pm, so I knew at least I would be fairly well rested. The 5:40 am start time meant I rolled out of bed at 3:20 am. Because the hubs is working nights, the babysitter got there at 4 am. One of the best things about the race was how close to home it was. It took less than 10 minutes to get to the parking lot, where I met Julia, Rachelle, Becky and Alisha. On my third trip to the potty, the gun went off (while I was inside). Luckily the start was close to the port-o-potties, so I got out there and started. Gotta love chip timing! The course was beautiful and just downhill enough to be fast but not painful. It was shady and overcast the entire race. It was cool but not cold at the start and it never got too hot. It was really ideal in almost every way. There were a few times I felt like I couldn't get a deep enough breath and there were several runners that looked startled when had to clear my throat, but my lingering cold didn't seem to affect me too much overall. During the race, I carried my handheld full of PowerAde. I walked through every other aid station and drank a cup of water. Sometime within the last five miles, I caught up to Blaine who was pacing the 1:55 group. I quickly introduced myself and then said I hoped to beat his pace time and waved goodbye. About mile 10, I realized I never used my energy gel and decided it probably wasn't worth it at the point. With three miles to go, I knew there was a good chance I would PR if I could maintain around a 9-minute pace. With two miles to go, I knew I could run a 10-minute pace and still PR. So I slowed down. What??? That's exactly what I thought as I hit the final mile. Why did I slow down if I didn't need to? My IT band was actually doing pretty well considering all the downhill. My legs were tired but not beat. And I felt good mentally. So I kicked it back into gear to finish strong. And I did, with a three and a half minute PR. Julia finished just after me and we exchanged a sweaty congratulatory hug since she got an awesome PR too. Then we ran into Rachelle, who ran an amazing race. Not much of a race report, but it was a great race and one that I will certainly do again. I will have more about my thoughts during the race in a guest post later this week, so I'll be sure to let you know when and where that appears. Also check back tomorrow for answers to your burning questions. You still have time to ask if there is something you are dying to know. 3 1/2 min PR! that is great! and with a cold?!!! even more fantastic!!! Wow you set a major PR Candice! That is so awesome considering you had been so sick leading up to the race. Congrats again on an amazing race!! Great race and an amazing PR!!! 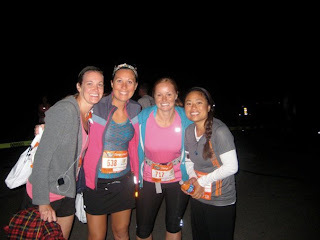 I love that the race had a 5:40am start time, I wish all summertime races started early before the heat sets in. I wish I had known about this race - that sounds so fun! Great job, your time is awesome! Way to go on the PR! I guess slowing downs means you'll be able to PR next time too! I am so proud of you!! I knew you could do it -even with cough, snot and all. Great job! Great run, well done! That is an awesome time! Here in SA we don't have chip timing so starting from the potty would not be ideal. You did great! Congratulations on the PR!!! Great running!! Congrats on the PR!! Been following your blog for awhile but never really comment. We have done similar races but I can never find you to say hello. I hope for a sub 1:55 at South Valley! Congrats again! You rocked it! Wow - What a great time! Congrats! I do have one question for Q&A - how did you think of the Runnerd term? That is my favorite running term ever now. Congrats on the PR! That is so awesome!! Congrats on a great finishing time and getting that PR!